Deal Physical damage to target enemy twice and Daze them for 2 turns. If this attack scores a Critical Hit, inflict Target Lock for 2 turns. Target Lock: This attack deals double damage. Deal Special damage to target enemy, Stun them for 1 turn and remove 100% Turn Meter. Then Empire allies gain 20% Turn Meter. Target Lock: This attack is a guaranteed Critical Hit and can't be Evaded or Resisted. Deal Physical damage to all enemies and dispel all buffs on them. If there are any defeated enemies, also inflict Deathmark for 2 turns on the primary target. Enter Battle: Remove 50% Turn Meter from the enemy Capital Ship, which can't be Resisted. 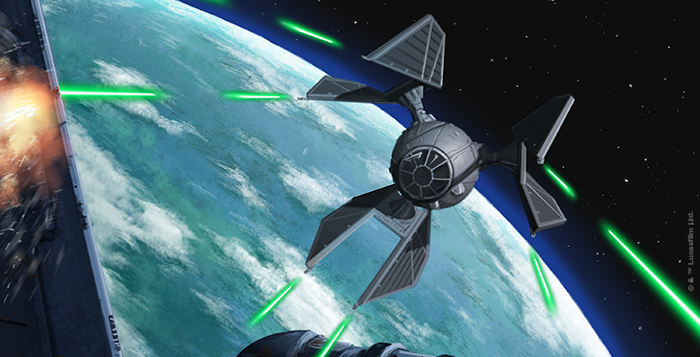 While TIE Defender is active, Empire allies gain +5 Speed and +10% Offense (stacking) each time they score a Critical Hit. Deathmark for 2 turns sounds pretty OP but it would be fun to have this ship in the game. Based on Star Wars Rebels, it should be fast, have shields, and a lot of firepower. But that's to say it has shields isn't to say it should be tanky - it's a huge ship that should be really easy to hit so perhaps it ought to be squishy in the same way the TIE Adv X1 is. Well the TIE Defender was the fastest, best-equipped starfighter in the galaxy at the time, better than the TIE Adv X1 itself, far exceeding all Rebel starfighters in speed, armament, defenses, and maneuverability, proving a deadly adversary! I tried to stay true to that! In Rebels, I think Hera said she couldn't see any ship beating it one on one due to its Speed, so that needs taking into account for sure. And it has lots of firepower. It was slightly bigger than standard TIE models, but not that big and for it's size it was extremely agile. It could simply outrun, outgun and outmaneuver every starfighter of it's time. It was that good. Period! AoE deathmark and daze, too OP. Even on a single target, an easy deathmark like that is OP. Deathtrooper requires one toon dead before deathmark can be applied. I like that idea better. I’d say lose the AoE and make a more difficult condition for deathmark. Dunno, in tie fighter I could kill just about anything with the defender from fighters to capitol ships. Tractor beam made it so OP. A-wing or tie avenger? 0 maneuver, enjoy an adv concussion missile up your exhaust. Maybe add another ability, tractor beam: fracture target, cannot be dispelled or copied. Target is immune to buffs and cannot evade. Tie defender resets cd and gains 100% tm. CD 8. I feel you on this one! The TIE Defender was the Alpha and Omega in Star Wars: TIE Fighter! But here i'm trying to stay true to the mechanics as ships with a crew of one character have only 3 abilities and adding a fourth ability like that would make the Defender too OP! Good ideas. I think his Ion cannon & reinforcement abilities are a bit too op. I would take some thing off that special because it has dispel stun tm removal & gain all at once. And I'd make his reinforcement either have smaller effects or affect only him +15 speed & +15% offense for everyone with every reinforcement seems much. However this is your idea & I'm no expert on the TIE Defender. I saw that you try to stay faithful to the source material and that's the way to go in my opinion ! Thanks for the tip! I reduced the speed and offense bonus on the hardware and also removed the "can't be evaded or resisted" on the 3-rd ability. It is unlikely since Baron Soontir Fel and even Maarek Stele are both Legends characters (which is unfortunate) and there already is a Canon character that pilots the Defender - Vult Skerris.